Global Health Initiative (GHI) at Chicago Lake Shore Medical Associates is a nonprofit organization leading through philanthropic advocacy. Funding from GHI provided medical students at Northwestern’s Feinberg School of Medicine (FSM) the opportunity to engage in a month-long global health experience in Oaxaca, Mexico with a lasting impact. Beginning in 2011, this has been facilitated in part through Child Family Health International (CFHI). 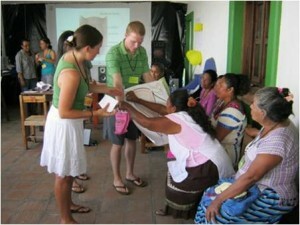 For the last two years GHI has provided support for eight to ten Northwestern medical students, some from Northwestern’s NU-AID International Development Group, to participate in CFHI’s Women’s Reproductive Health in Mexico Program, learning about the Mexican healthcare system alongside local health professionals. Students get first-hand experience teaching a curriculum devised by the Ministry of Health on prenatal and postnatal care for for expectant mothers at government-run primary healthcare clinics. Students develop cultural competency through learning to interact with patients from diverse backgrounds, including indigenous populations, as well as improving their Spanish and communication skills that go far to build rapport and connections with patients. FSM students go above and beyond the call of the program and support CFHI & Northwestern University School of Medicine Project training for parteras, or traditional midwives. Throughout the year NU-AID student members raise money to contribute towards a 5-day training for over 30 traditional midwives who attend over 40% of the births in the region. This training workshop focuses on early recognition of labor complications, sterile birth techniques, and treatment of common post-partum issues. Data from these trainings reflect a statistically significant improvement in the parteras’ level of understanding and abilities, findings that have been featured in the local press. After the training, the GHI donated an additional $10,000 to directly support rural clinics in Oaxaca, and created a video documenting the experience. This project exemplifies a successful collaboration between US medical students, Feinberg School of Medicine, CFHI, GHI, and local health care providers. This cooperative approach allows for bidirectional exchange of information, solidarity, and a mutual passion for global health.